Even more so than heritage buildings, heritage landscapes are fragile entities. Composed of often ephemeral elements and frequently overlooked and undervalued, the art of the landscape architect is all too vulnerable to inadequate maintenance, insensitive alterations or outright destruction. 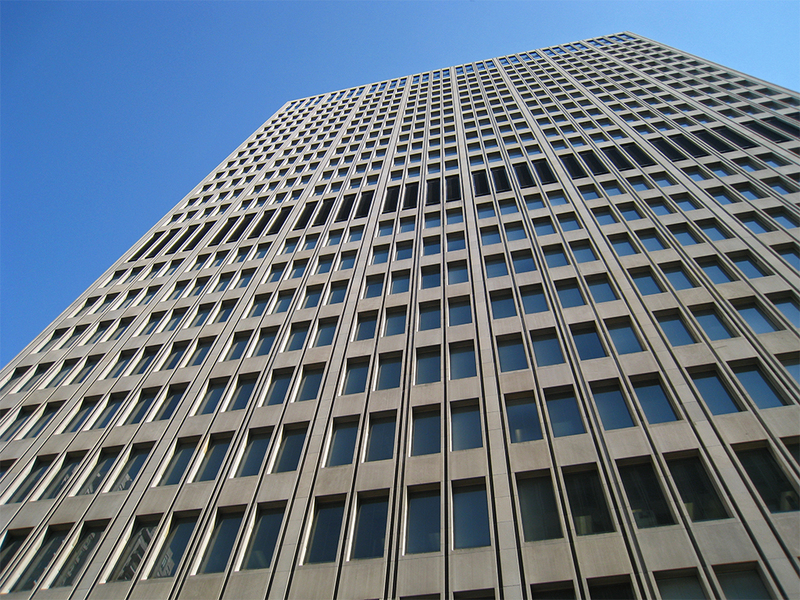 In Toronto, a significant Modernist heritage landscape that has avoided such a fate is the Queen’s Park Complex at 900 Bay Street, built between 1964 and 1971 as the Government of Ontario’s flagship offices. Surrounding the four-tower complex, beautifully integrated with the architecture and site, is a peaceful, serene oasis of greenery designed by Hideo Sasaki, the renowned Japanese-American landscape architect, with Richard Strong of the Sasaki firm’s Toronto office. Trained at Harvard University and later chair of the school’s department of landscape design, Sasaki was a leading Modernist landscape architect of the postwar era and received worldwide acclaim for classics such as Greenacre Park in New York City, Eero Saarinen’s Deere & Company World Headquarters in Moline, Illinois and Waterfront Park in Charleston, South Carolina. For the Queen’s Park Complex landscape, Sasaki eschewed the windswept plaza-and-a-sculpture clichés of the period and instead established a series of outdoor rooms on all four sides of the site, enclosed by plantings and linked by carefully considered pedestrian connections. 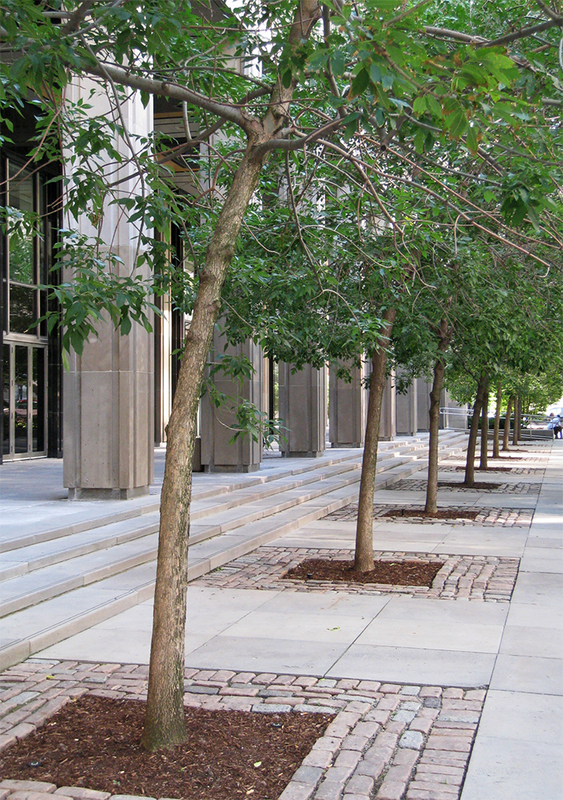 The primary landscape faces Bay Street to the east and is the most formal and urbane, a limestone entrance court bordered by Japanese yew hedges and subtly divided by elevated planting areas, seating benches and rows of Japanese flowering crabapple and white birch trees. Greeting arrivals at the busy Bay/Wellesley corner is The Three Graces, a sculptural bronze fountain by Gerald Gladstone that emerges from a series of shallow reflecting pools. The north, west and southwest landscapes are more informal, with gently sloping berms and naturalistic clusters of trees and shrubs amid green lawns. All the landscapes flow smoothly together, connected by a continuous ground plane of limestone pavers. Adding to the engaging and rewarding pedestrian experience is the sheltering effect of the deep entrance porticos at the base of the towers and the high quality of the building itself: the elegant, subtle detailing, fine materials and impeccable craftsmanship reward close study. The complex exudes a sense of pride and purpose, a belief in government as a force for positive change that seems poignant in today’s context. 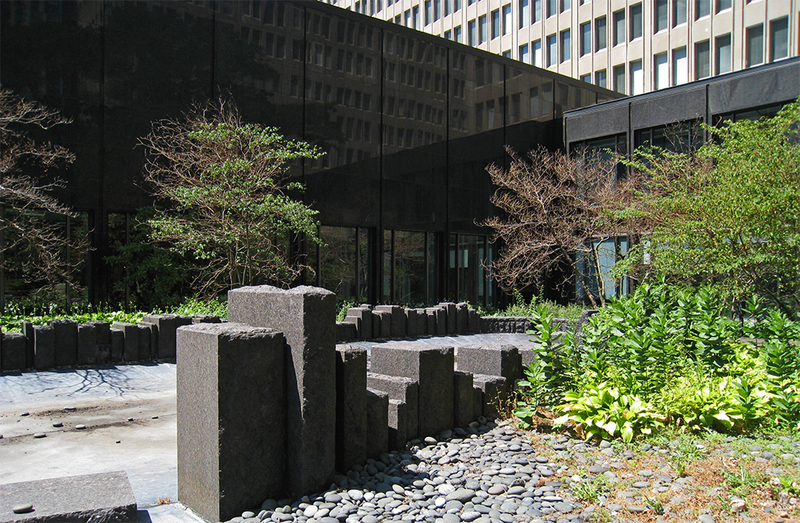 Sasaki’s landscape design also included an outdoor courtyard, set in the middle of the complex and visible through the glass walls of the main Bay Street entrance. 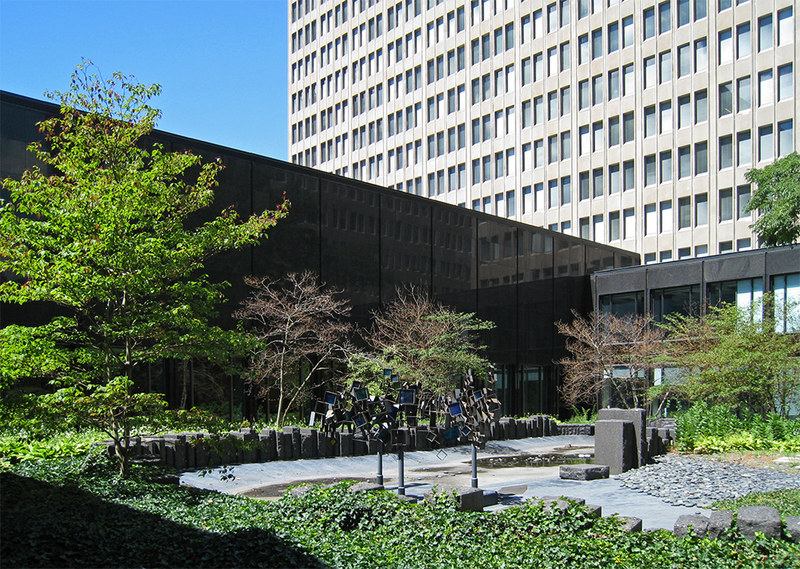 Here, the rectilinear grid of the surrounding buildings is broken by an organically-curved reflecting pool; its edging of rough-textured black granite blocks loops across itself and continues onward into the landscape. 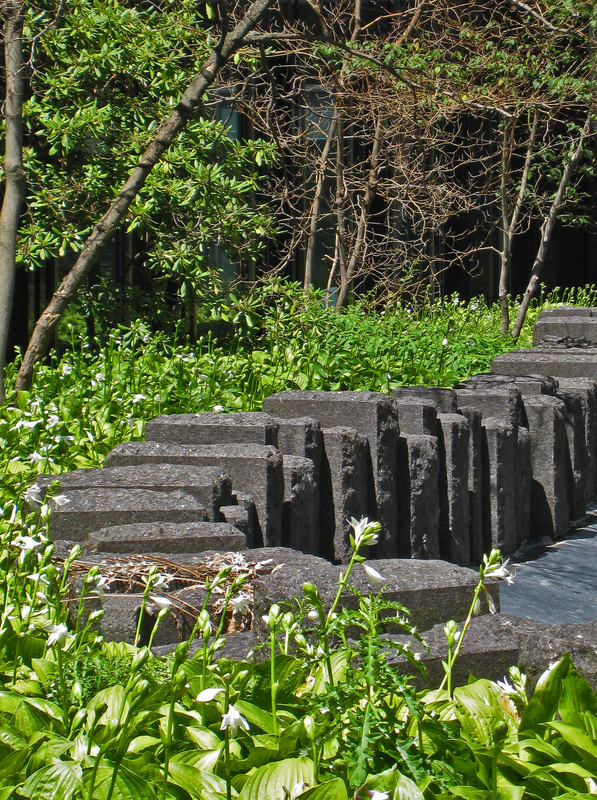 Water patters soothingly from the pool’s fountain, an assemblage of bronze cubes by E.B. Cox. Sasaki’s interpretation of traditional Japanese gardens is reflected in the courtyard’s winding stone pathways and viewing platform, ornamental trees and shrubs and thick ivy groundcover. Public art was another significant landscape component. 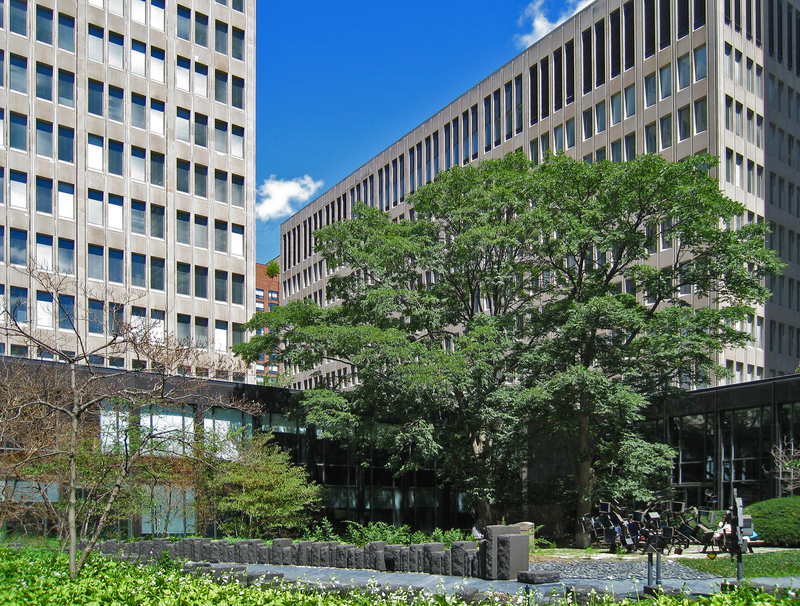 As well as the Gladstone and Cox pieces, the province commissioned sculptures for the complex’s four primary entrances: Walter Yarwood’s The Pines on Wellesley Street; Jack Harman’s Mother and Child at the adjacent Whitney Block; Paulosie Kanayook’s Hunter with Seal on Bay Street and Louis Archambault’s towering Man and Woman on Grosvenor Street. The art program continued inside with more than twenty permanent installations by the likes of Jack Bush, Kazuo Nakamura, Jordi Bonet and Harold Town. After years of neglect, the Queen’s Park Complex landscape was restored in the early 2000s in accordance with a heritage landscape assessment and master plan by heritage architects ERA Architects, landscape historian Mark Laird and landscape architects Hough Woodland Naylor Dance Leinster. It has been designated by the Province of Ontario as a significant landscape of cultural and heritage value. To find out more about the Queen’s Park Complex and other significant designed landscapes in the U.S. and Canada, visit The Cultural Landscape Foundation. This is such an interesting yet overlooked space at the centre of the city. Thanks for the post. Many thanks for your post on the Sasaki Landscape. 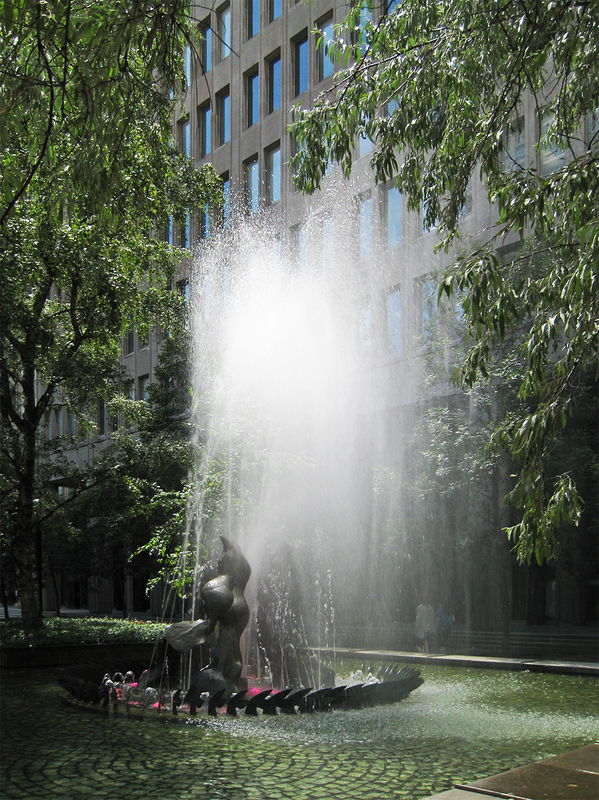 My wife and I live in the Manulife Centre, at Bay and Charles, and I often take a detour through the Sasaki grounds. I’ve always enjoyed its beauty, and it’s a treat to learn more of its history and importance.